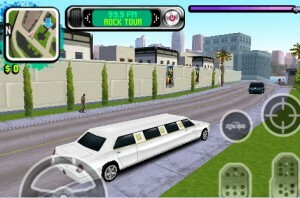 The iPhone has so far seen both 2D (Car Jack Streets) and 2.5D (Payback) GTA-clones but, as yet, iPhone gamers have not had a fully 3D world in which to wreak the particular sort of inner-city mayhem that has made the genre so popular. Thanks to Gameloft, that’s about to change. Yesterday Touch Arcade visited Gameloft’s Manhattan studio to have a look at a preview build of their upcoming Grand Theft Auto-like iPhone title Gangstar: West Coast Hustle. The studio’s forthcoming Gangstar, which is an enhanced port of their 2006 mobile handset title, is a fully 3D take on the formula, set in an expansive world (Los Angeles) that strives to bring the modern, home console GTA experience to iPhone gamers. The story goes something like this: Our hero, Pedro, has recently been released from a Mexican prison and has crossed the border into the U.S., arriving in LA, where he meets up with his friend Juan’s cousin who recruits Pedro to get revenge on the rival Los Matadors gang. Missions to this end include collecting guns, killing people, even helping people — but mostly killing people. There are mini or side missions to keep things varied as well, such as heading across town to pick up a gun at a friend’s house. While unquestionably a GTA-inspired title, Gangstar departs somewhat from the formula of the original by not including any missions dealing with the drug trade or prostitution. There is no money to be made in selling jacked cars to chop shops, either. 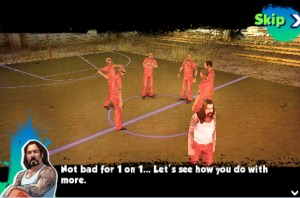 In Gangstar, it’s killing people that gets you the cash. Whether by close fist combat, machine gun, or just a good old fashion squish-and-run, murder is the currency of the game. As such, Gameloft expects the game to receive a “16+" ESRB rating. The game is a free-roam sandbox affair, with LA being the sandbox. And the game world is actually modeled after LA with some accuracy. Hollywood, Santa Monica, South Central, and other well-known areas of the city are represented with many distinguishing characteristics in place. Portions of the game are also played through sequences that are flashbacks to Pedro’s time in the Mexican pen. The game is rather cut-scene heavy, with most of the back-story and missions being laid out in on-screen text dialog during the in-engine scenes in question. Happily, the frequent cut-scenes can be quickly tapped-through and are generally to-the-point, without lavish theatrics that might slow down gameplay. Most any car in the game world can be jacked for transportation, and certain vehicles are presented during cut-scenes to be used to complete various missions. Certain vehicles must be unlocked through play progress before they are accessible, however. All that killing and jacking and general mayhem will, of course, get the attention of the police before long. Cops in this game are pretty aggressive, but luckily there are ways to work through it. When you’re the target of an APB, various police badges appear around the city, shown on the on-screen map. Each one you pick up reduces the cops’ alert level. But grab them fast. And if that doesn’t quite work out for you, it’s possible to “corrupt" cops and bribe your way out of a sticky situation — but it’ll cost you. 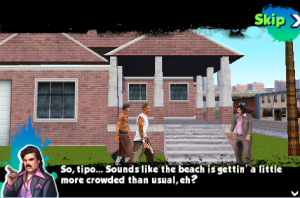 When on foot, an on-screen stick is used to control Pedro, with a set of contextual tap buttons to perform actions. Vehicles are controlled through a choice of any of three different controls methods: stick (which is a left / right slider for steering), on-screen steering wheel, and tilt-based control. When fighting (with fists or guns), a tap to the enemy of choice will lock onto him, directing all attacks directly at him. I tried out all control methods save tilt and found them to work very well. On the audio front, Gameloft definitely didn’t skimp. A total of four different radio stations can be accessed with each vehicle’s radio: rock, latino, techno, and hip-hop. Each station delivers all-original music as well as DJ commentary. A very nice feature of the game that utilizes iPhone OS 3.0 is the ability for players to listen to their own music instead of the on-air radio (using OS 3.0 devices). There is currently no online gameplay or scoreboard component, but Gameloft indicates that they are now in the process of planning upgrades that will be released over time, adding features to the title. This hands-on video shows the game in action on a 2nd Gen iPod Touch. An earlier video was also shown when the game was first announced, but that was not shown running on an actual device. Gangstar: West Coast Hustle looks like a very solid take on the GTA formula that, even in my short time with the game, impressed me with its large, sprawling game world. This, coupled with the choose-your-mission nature of the title, should make for very significant playtime. We’ll take a much closer look when the game goes live in August but, from what I’ve seen so far, Gangstar might just provide iPhone gamers the most potent GTA fix in the App Store.